What are potassium supplements in pets used for? Potassium supplements can be used in cats and dogs if they have a potassium deficiency, urinary stones, and other diseases. Common causes of low blood potassium levels (hypokalemia) include chronic kidney disease (CKD), some medications, inadequate nutrient intake, and many more. Diuretics are a common medication that can cause low potassium levels, and using a diuretic may require potassium supplementation. Potassium supplements can be used long or short term, depending on what is causing low potassium levels. If diarrhea, chronic dehydration or decreased intake is causing hypokalemia, the treatment may be short term, until your pet’s symptoms have resolved. When chronic diseases are affecting your pets potassium levels, the treatment will likely be long term. If your pet has been diagnosed with kidney disease, is currently on blood pressure medications or has been experiencing vomiting or diarrhea, then it may be beneficial to have your veterinarian monitor their blood potassium levels. When should potassium supplements in pets not be used? Potassium supplements should not be used in pets with hyperkalemia (high blood potassium levels), renal failure, severe renal impairment, untreated Addison’s disease, acute dehydration, or in pets with GI motility impairment. They should also be avoided when your pet is currently taking and ACE inhibitor, Digoxin, NSAIDS (Rimadyl, Norocarp, Previcox, and others), or potassium sparing diuretics such as spironolactone. Your trusted pharmacist at VetRxDirect can assist you if you’re concerned about adding potassium supplements to your pet’s current medications. 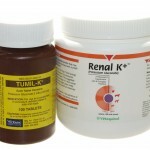 What kind of potassium supplements for pets are available? form can increase urine pH. There are a wide variety of oral potassium supplements available, and some require a prescription. Some of the potassium supplements also have cranberry extract in them, which is beneficial if your pet is prone to urinary tract infections. The cranberry makes bacteria less likely to attach to the bladder wall and grow. At the end of this article is a comparison table of the products that we carry at VetRxDirect and what they are used to treat. You can use this to compare the different products that are available to the one that your pet might use. If your companion requires potassium supplements, it is important to keep all follow-up appointments with your veterinarian because their potassium blood levels should be watched closely. You should consult your veterinarian especially when purchasing and administering the non-prescription products because incorrectly dosing your pet with potassium supplements can be dangerous.Your veterinarian will be able to recommend the correct dose, and help you decide which product is best. Regardless of what kind of product you are using, you should be aware of signs that your pet may have too high of blood potassium levels: if your pet seems abnormally weak, has a very irregular heartbeat, or if they seem depressed. These side effects of potassium supplements are serious and indicate your pet should be seen by your veterinarian. It is important to only use the potassium supplement for as long as your veterinarian recommends, especially if it is intended as a short term treatment. Treating your pet with potassium supplements for longer than your veterinarian recommends could cause your pet’s potassium levels to get too high. You should also watch your pet’s fluid intake because they will need to be well hydrated to keep their potassium levels steady. With proper monitoring and regular administration of potassium supplements, low blood potassium levels can be corrected and/or maintained. The key to a safe and effective treatment is to develop a close relationship with your veterinarian. Not only is it important for your veterinarian to check up on your pet regularly, but you should also be monitoring your pet’s mood and overall health. Awareness of health changes can prevent your pet from overdosing on their potassium supplements. With knowledge about potassium supplements, you should be better able treat your pet’s low blood potassium safely and effectively. 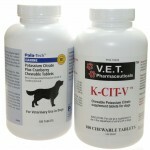 Does your pet take a potassium supplement? Which ones have you tried, and have they worked well? Feel free to leave any remaining questions about potassium supplements for dogs or cats in the comments below or utilizing the Q&A feature on the respective product pages. Reference: “Hypokalemia.” Cornell University. Cornell University, n.d. Web. 12 Apr. 2014. This entry was posted in Pet Kidney Health and tagged Potasium Supplements for Dogs, Potassium Citrate for Cats, Potassium Citrate for Dogs, Potassium Gluconate for Cats, Potassium Gluconate for Dogs, Potassium Supplements for Cats by by Abigail Maas. Bookmark the permalink. Hi! Thanks for your post. What supplement and what doses you recommend in a heart patient in treatment with furosemide? Since so many pet medicines are also human medicines, how do you feel about using human vitamins with dogs? Would the dosage be the same or how would it be adjusted please? Thank you. © Copyright 2019 – VetRxDirect, Inc.